Google doodle honors Grace Hopper, "first lady of software"
Google is honoring the “first lady of software,” computer sciences pioneer Grace Hopper, with a Google doodle on what would have been her 107th birthday. 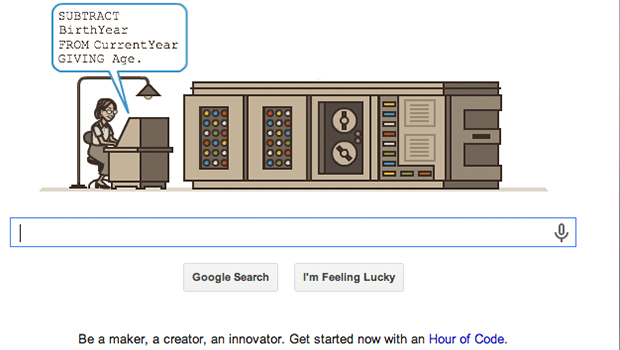 The doodle shows a cartoon of a woman at a massive computer, plugging in code, just as Hopper spent many hours doing as she helped program the original computer, the Mark I. She was also the co-inventor of COBOL, a business-oriented programming language. Many credit her with teaching computers to talk. Nicknamed "Amazing Grace," Hopper broke down barriers and encouraged others to follow suit. "The only phrase I've ever disliked is, 'Why, we've always done it that way,'" she once said. "I always tell young people, 'Go ahead and do it. You can always apologize later.' "
Born in Arlington, Va., on Dec. 9, 1906, Hopper was a curious kid who didn’t shy away from mischief. According to biographer Elizabeth Dickason, when Hopper was seven years old she decided to figure out how clocks work. She dismantled seven alarm clocks before her mother caught on. Hopper graduated Phi Beta Kappa from Vassar College and earned a Ph.D. in mathematics at Yale University in 1930. She taught at Vassar before joining the U.S. Navy in 1943, in the heart of World War II. She almost didn’t get in – weighing just 105 pounds, she was 15 pounds below the military weight requirement. Hopper became the first programmer of the Navy's Mark I, a marvel of its age that could perform three math problems every second. She also worked on many of its successors, including the UNIVAC I, the first commercial computer. Perhaps her most oft-repeated contribution to coding is the term “bug,” which she coined after tracing a computer failure to a moth trapped in the machine. By the time she retired in 1986, she held the title of rear admiral and was the nation’s oldest active-duty military officer. Even after retirement, Hopper was repeatedly brought back for year-to-year extensions because she was so vital to the Navy's computer programs. At her retirement ceremony, Hopper received the Department of Defense’s highest honor, the Defense Distinguished Service Medal. "She has challenged at every turn the dictates of a mindless bureaucracy," former Navy Secretary John Lehman said during the presentation. Below the Google doodle honoring Hopper, there is a link to a video that encourages people to learn to code. “Be a maker, a creator, an innovator. Get started now with an Hour of Code,” it reads. The link brings you to a video featuring two young computer science students, Leigha Benford and Tanya Parker, who help teach actress Angela Bassett, actor Ashton Kutcher, NBA star Dwight Howard, and others how to code. Their goal, they explain, is to get 10 million students to participate. The video also features messages from President Obama and Microsoft founder Bill Gates and Senator Cory Booker of New Jersey. It is a mission that Hopper would have fully supported. “The most important thing I've accomplished, other than building the compiler, is training young people,” she once told biographer Lynn Gilbert. “They come to me, you know, and say, ‘Do you think we can do this?’ I say, ‘Try it.’ And I back 'em up. They need that. I keep track of them as they get older and I stir 'em up at intervals so they don't forget to take chances."